Here's a panorama shot of the new west park. 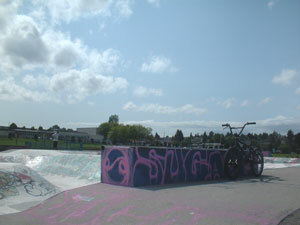 The New Westminster park is a bunch of interconnecting bowls with 'endless humps and bumps' all over the place. There are a few ledges scattered around and a 4 sided pyramid near one end. It's a super fun place to carve around jumping hips and basically just hitting whatever ends up in front of you. The bowl seems to have a little bit of a moisture problem so aim to hit it up in the late afternoon. 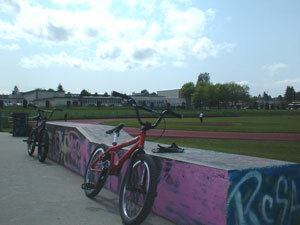 Also I keep hearing rumors that the park is getting torn out so that the city can build a new high school. Get there and ride before it's gone. 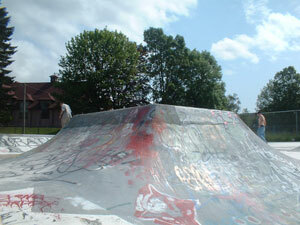 The top part of the park starts out with a shallow section with a little curb/sub and some mini ramp action in between the banks and the short sides of the pyramid. The shallow end drops into a deeper bowl that has a big turd down the center dividing it into sort of a snake run on one side and a rectangular bowl on the other. The pyramid sits right at the junction between the shallow and the deep rectangle and is 3' tall on 3 sides and about 6' tall on the other. The pyramid has trannies on all sides so it's super fun to jump. The sub box is off the side of the rectangular section of the deep bowl. After the deep bowl is another rectangular deep bowl with a hip in the side facing the rest of the park making it into sort of a heart shaped bowl. You transfer into this section via two 'spines' which are really thick, round and shouldn't really be called spines. 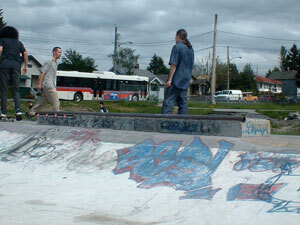 There is coping around most of this bowl but it's nothing you could get your pegs on. Also near this end is a kinked ledge and a low, long ledge that transfers over a little channel thing. It's really hard to explain this place so check the panorama and the photos below. This park is all about carving around and finding good lines over the hips and bumps. Riding it just made me want to carve around, do some skids, and it gave me a craving for Kokanee. Super good park for hanging out and having a beer on a hot summer day. If you get sick of flying around you can always ride the sub or the box jump/ pyramid thing. It's a pretty mellow scene at this park, on a weekday it was really dead until the high school next door emptied out at 3:10pm. By about 5:00pm most of those kids were at home for dinner so the park emptied out again. From downtown, get on the Skytrain and take it Eastbound to 22nd St. Station. The streets in New Westminster are all numbered, North/South are Streets and East/West are Avenues. Get off the Skytrain and go East one block along 7th Ave. Turn left at 21st St. and go North one block up the hill. Turn right at the lights onto 8th Ave. and get ready to ride. You need to follow 8th Ave. for 16 blocks East. When 8th Ave. hits 6th St. there is a gas station and 7-11 or something on the corner. Turn left and you'll see the park along 6th St. on your left. 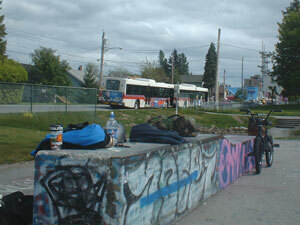 There is a bus, the 101 Lougheed Station, that leaves from the Skytrain Station and goes most of the way along 8th Ave. It does a little detour into 'downtown New Westminster' but after that it goes right past the park. Just stay on the bus and keep your eyes open. This bus has a bike rack that will fit 2 bikes. There's my coffee mug sitting on the kinked ledge right by the entrance. Nobody rides this ledge, they just sit on it all day. 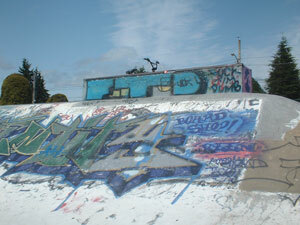 This is another ledge around at the other end of the park. It's exactly the same as the first kinked ledge, it starts out at tire height and ends up at upper headset cup height. If you squint you can see a low ledge, just over peg height, that transfers over a little channel. The ledges here have thick metal L bar on them that grinds really fast. This is the bank to sub in the shallow end. don't get excited, the coping on this box is about an inch below peg height but it is possible to stall it if you lean over a little. Here's a shot from the deck of the last ledge. As you can see it's right at tire height and is pushed up against the edge of the bowl. 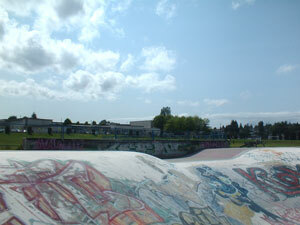 This is a shot of the same ledge from inside the bowl. You can see it makes a really good bank to sub box. Here's a pic of the 4 sided box jump from the big side.